This week, Ford Motor Company was forced to halt production at their Dearborn, Michigan truck plant due to some suppliers’ inability to keep up with the demand of the rapidly recovering auto industry. Roughly 3,000 employees of the Ford Dearborn Truck assembly plant were forced to take this week off as production of the F-Series came to a screeching halt which stems from supplier shortages at Ford’s Brook Park Ohio engine production facility. Brook Park is responsible for the 3.7L Duratech and 3.5L EcoBoost V6 engines offered in the 2011 F150 and while there has been no clear explanation of which actual engine components are responsible for the stop in production or the suppliers at fault, the engine facility has also had occasional one-day shut downs due to these supplier shortages. The early popularity of both the 3.7L base model V6 and the high-tech 3.5L EcoBoost in the 2011 Ford F150 have come as good news to the industry but with suppliers attempting to get back into the flow of production to meet this booming demand, this comes as an unfortunate and untimely blow to Ford Motor Company. 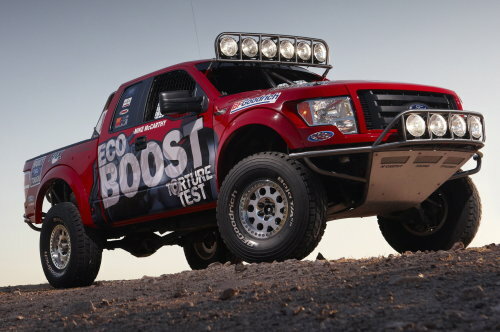 The new EcoBoost V6 in the 2011 F150 has been one of the Motor Company’s most highly touted engines since the full details were released but with the automaker running into shortages in production, this could cause a very inconvenient delay in getting the new turbocharged pickups to consumers. According to multiple sources, the shutdown at the Dearborn Truck plant is only scheduled to take place this week and with any luck, this short downtime will allow suppliers to play catch up – hopefully helping to decrease the likelihood of future work stoppages. However, some analysts expect that the continued improvement of new vehicle sales around the world could lead to more stoppages based on the inability of suppliers to provide these essential components.